Today is the first day of Lent in the Byzantine calendar. 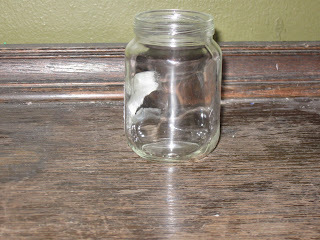 We have decided to do a "Deed" jar with the boys this year. Everytime they do a good deed or act in a charitable way they will get a jelly bean to add to the jar. Starting schoolwork on their own, setting the table without being asked, etc., all these things can earn a bean. On Easter Sunday we will divide up the beans and they can either eat them or cash them in for some piggy bank money. There are some rules that go alone with this. If they ask for a bean, they don't get one. They can say why they think someone else should get one, but they can never request one for themselves. There is no limit to the amount of beans they can earn in a day. They do not each get their own bean jars because that would defeat the purpose of helping each other to act in charitable ways. 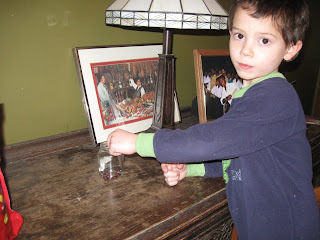 One of the beans that Isaac earned today was for being so quiet at the evening Liturgy that he attended with Michael. Okay, they aren't really jelly beans. They are Skittles. When I was at Sam's Club I was shocked to see that Jelly Beans were over $12.00 for the container. A 54 oz bag of Skittles was just over $5.00. Skittles are much more popular around here anyways. I love this activity, but I think I would eat all the beans before Easter, myself! 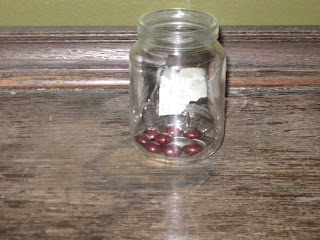 Did you see the blog idea where the mom fills in the jar at the end with the white beans to show how God's grace makes up for what we lack? I liked that one too- your kids are so cute! Issac looks so serious...~and Henry looks like the comic relief- you better watch him! Now This Is More My Style!